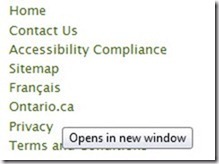 Check out the Accessibility Checklist for Blog Posts (opens new window). Individuals needing larger text cannot resize the tooltip text within the browser alone. Check out the Accessibility Checklist for Blog Posts. which includes title="Opens in a new window". Try accessing the title via your keyboard or increasing the font size of the tooltip from within your browser. Go ahead and try; I’ll wait. Again, not overly thrilled with using the title as the solution, I did what any good consultant would do. I went searching for a better solution, which led me to the WCAG 2.0 Technique G201: Giving users advanced warning when opening a new window. The second example "Using CSS to provide a warning before opening a new window" looked promising. By using cascading style sheets (CSS), the text “Opens a new window” is hidden off screen until the link receives focus, at which point the message becomes visible with a brightly coloured background. the font size can be increased from within the browser (no need for additional magnification software for individuals requiring only larger type). I was intrigued, but wanted another opinion. I tweeted, of course. Both Steve Buell and Marco Battilana (@crazybat) responded, and concurred the CSS technique was more accessible but that the code could be clearer and even better. the drop shadow further emphasizes the message. Causing a link to open in a new window should be done in only select circumstances, however announcing that this is about to happen can be done with grace and trendy style. Who says accessible web design needs to be boring? It’s a nice technique Glenda and the keyboard focus aspect is good. I foresee a slight downside though which is the extra span that’s required in the markup. How many bloggers who are not well versed in HTML will remember to put that in? Maybe the CSS could actually automatically generate the span for all rel=”external” links. Is CSS generated content voiced by screen readers? Alternatively I suppose if using WordPress it would be possible to create a filter to add the span in automatically. There is a difference however between links which open a new window and links to external sites. Your article is about the former and the demo is about the latter. That’s not to say the techniques can’t be combined. Accessible web design refers to the creation of web pages that are accessible to all users, including users with disabilities. Accessible web design is built in aid of many disabled people including those who are visually impaired (poor eye sight, colour blindness), motor impaired (Parkinson’s disease, cerebral palsy) and hearing impaired (deaf).